Allergies can be very annoying and debilitating and can recur every spring and early summer with the bloom of pollen and other seasonal changes. Various drugs provide temporary relief for symptoms, but they only treat one problem at a time, and do not address the underling cause. Medication may give temporary relief for itching and sneezing but you will need another drug for the congestion. Most people don't want to have to take a cocktail of drugs for a month of more till the seasonal pollen peak passes. There has to be a better and less expensive way. 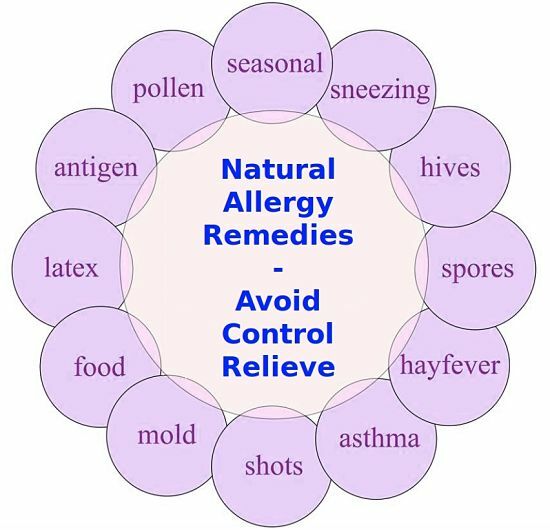 The answer is natural remedies to provide relief, and ways to prevent and control the specific cause of the problem and to control the source of the allergen. Prevention is always better than treatment. Most people treat allergy symptoms by popping a pill without ever finding out exactly what is causing their allergic response, or even if they actually are suffering from genuine seasonal allergies or something else. While hay fever is a prime culprit in Spring, other things can also cause the same symptoms and there may be allergy triggers that are not of seasonal. Many people who say they have seasonal allergies, have them all all year round and it is the weather or higher humidity that makes it worst in Spring. Find the cause and you can better treat the symptoms or avoid the allergens. If you have a serious chronic allergy problem then find a allergist who can devise a treatment plan ( see AllergyandAsthmaRelief.org and other similar sites). Before you commit yourself to popping expensive pills for one to two months, why not find the cause and prevent it. Drugs have side effects and can damage your body with prolonged use. Allergy symptoms develop when your immune system over-reacts to an allergen - that is something that it sees as a threat, but that is usually is harmless, such as dust mites, plant pollen, molds, insect stings, chemicals or various types of food. Your immune system responds in various ways as if the allergen were a dangerous threat. A chemical called histamine is released, which is responsible for many of the allergy symptoms at the site of the 'attack' and elsewhere in the body. If the allergen is air-borne, the reaction will be seen in yours nose, eyes, and (or) lungs. If the allergen is in food that you eat, it may affect your stomach, mouth and intestines. Food allergies also can cause skin rashes, swelling around the eyes or even asthma symptoms. People who are allergic to prawns may shown extreme swelling around the eyes even if they don't tough them with their hands. Allergy symptoms, and your body's responses in dealing with them, will vary according to the type of allergen. Some of the types are shown below. To learn more, visit the allergy page at various websites such as this one. Many seasonal allergies are the classic hay fever types which results in bouts of sneezing, sore eyes, congestion and even breathing problems. Many weather reports throughout the world now include general pollen counts for various districts. It is worth while trying to find out the specific plant that is the source of the pollen or other things that are triggering the allergic response. Various countries have specific web sites that provide information on plants that cause allergies, and when are where they are likely to cause problems. Knowing this you can plan a strategy for avoiding, preventing and controlling your allergy. 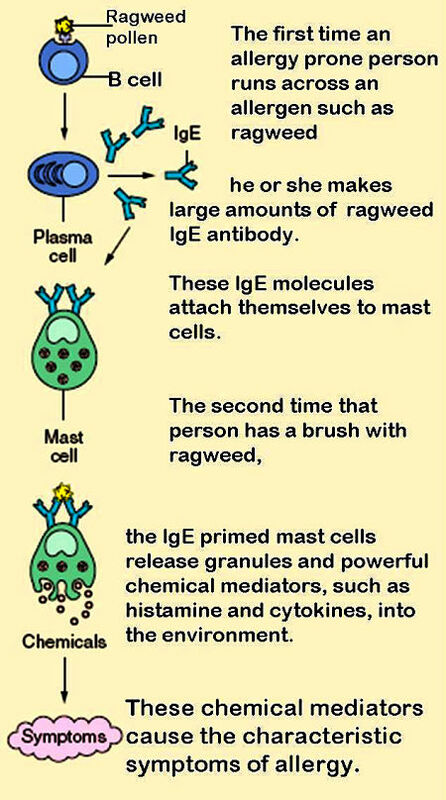 Shown below are lists of plants that commonly cause allergy problems in Australia and USA. Things like pollen, dust mites, cockroaches, cigarette smoke, various plasticizers and industrial chemicals, or even hair spray, the artificial fragrances in candles, or air fresheners (!!) could be causing symptoms similar to hay fever allergies.You may have introduced something new into your house that has triggered the allergic response. There are many things around your house you can do to remove or reduce the cause of the problem. One excellent idea is to wash your bedding in very hot water every two weeks or so to help control dust mites, use anti-mite covers on pillows and mattresses, use nontoxic pest management methods to control cockroaches and pests. However while these things may help generally, the best way to tackle the problem starts with identifying the cause. Only then can you find a specific prevention and control method and a specific treatment to the cause. Temperature and humidity - Hot and very humid houses create breeding grounds for molds and dust mites, and so keep temperature at moderate levels - 70 F (21 C) and keep relative humidity below 50 %. Air Filter and Purifiers - Regularly clean or replace all the small-particle filters installed in central heating and cooling systems and in the various room air conditioning units you make have installed at least once a month. Install air-purifiers if your research shows they will be effective. Pests Control - Controlling all insect pests in the home such as bed bugs, dust mites, cockroaches as well as rats and mice is very important. You can do it yourself or get a professional exterminator. You will have to vacuum thoroughly, wash hard surfaces and clean out residues in cracks and tiny cavities. Weekly cleaning routine - Using a mop, thoroughly clean wood or linoleum flooring and vacuum carpets and rugs, using a vacuum cleaner with a high-efficiency particulate air (HEPA) filter or a small-particle filter. Use a damp cloth to clean all other surfaces, such as windowsills, the tops of doors and window frames. If you have allergies, always either wear a dust mask when cleaning. Air filtration - Select an air filter to remove allergens, such as small-particle or HEPA filter. Install and use a dehumidifier to reduce dampness. Keep it clean. Bathroom - Keep all surfaces, including the sink and tub, clean and dry after use. Run your exit fan to remove humidity. Scrub mould from the shower curtain, shower enclosure and walls using a non-allergic spray. Avoid commercial bleaches which can trigger allergies. Bedding - Encase mattresses, pillows and box springs in allergen-proof covers. Wash bedding in scalding hot water once or twice a week. Clothes Dryer - Vent moisture outside and open doors when operating. Clutter - Remove items that collect dust in the home such as ornaments, books, etc. Store them in cupboards and cabinets with glass doors. Store children's toys, games and stuffed animals in plastic bins. Curtains and Blinds - Replace your curtains with washable version made of cotton or synthetic materials. Replace blinds with washable shades that do not accumulate dust. Flooring - Remove ALL carpet and rugs from your home, and replace floor coverings with hardwood or linoleum flooring. Food waste - Keeping your kitchen free of food crumbs and get rid of garbage and waste quickly. Meticulously avoid rodents or cockroaches. Furniture - Avoid upholstered furniture and choose varieties made of wood, leather or metal. Heating - Avoid use of wood-burning fireplaces or stoves, which can trigger respiratory allergies. House Moisture and Leaks - Check, find and repair any sources of leaks or water damage in the home. Kitchen - Wash dishes frequently. Scrub the sink, kitchen surfaces and walls to remove mould and food debris. Install fans and ventilators, that expel air to the exterior, to remove cooking fumes and reduce humidity in the kitchen Be aware that most stove-top hoods simply filter cooking particulates without venting outside and so retain the allegens. Pets - If you can, find a new home for your dog or cat. Keep pets out of the bedroom at all times. Wash pets regularly to reduce the amount of allergen in the dander they shed in the house. Plants - Wipe up excessive moisture and check for fungi and moulds on the leaves and pot surfaces. Discard any plants from your house or garden that is likely to cause an allergic reaction. Ventilation - Install and use exhaust fans to reduce humidity in your home. Walls - Remove wallpaper next time you renovate and re-paint with mould-resistant low allergy enamel paints. Windows - Close windows and minimize the flow of pollen and mould spores into the house. Keep well hydrated to flush out excess mucus that triggers problems. Try various herbal remedies and find the option that works for you. Try nasal irrigation methods to regularly flush out your sinuses. Maintaining adequate level of probiotics in your gut can help provide allergy relief. Eat healthy yogurt and try various remedies. Buy dust-proof covers for your mattresses and pillows. Keep the humidity levels in your home as low as possible as high levels can cause fungi and moulds to develop. Consider buying a dehumidifier if necessary. Wash your bedding twice a week using very hot water to help kill dust mites and help remove allegens from pets and other sources. Go herbal and try Homeopathic remedies and treatments - Look for a formula with olive leaf, caper, black currant and Panax ginseng, such as Seasonal Freedom and other treatments. Boost your probiotics, whether in yogurt or in a supplement. This is a great way to boost total body immunity. Nasal flushing - Flushing the inside of the nose with saline (salt) solutions can be an effective way to relieve sinus symptoms. This flushes out the pollen and thins the mucus and helps to clear nasal passages. There are various herbal and homeopathic versions. Do your walking or running exercises or outdoor work in the afternoon. Pollen counts generally peak in the morning from 5 am to 10 am. If necessary use a pollen-filtering mask when working outside. Monitor pollen count reports. Rainy, wind-free and cloudy days usually have lower pollen counts. Butterbur: also known as petasites, is a large-leaf shrub that is toxic but appears effective in treating allergy symptoms. Quercetin: Another herbal supplement that has been shown to be effective in reducing sinus pain and congestion. Antioxidant Vegetables and Fruit: Grape seed extract, which is sold in various health food stores and other outlets, has been shown to be effective in treating allergies. Apples, onions, bananas and many fruit and vegetables have anti-inflammatory properties and may help to maintain your immune system. Some foods can magnify allergy symptoms from mites and pollen. These foods include pears, celery, carrots, parsley, peppers kiwi, cherries, peaches, nectarines, and nuts like walnuts, hazlenuts and almonds. Omega-3 Fatty Acids: A German study suggested that foods rich in Omega-3 fatty acid, for example salmon, tuna and walnuts tended to have the fewer allergies. Echinacea may worsen seasonal allergies as it stimulates the immune system. Use a neti pot and herbal nasya oil to clean your sinus passages, or the Ayurvedic remedy trikatu. The Ayurvedic herb boswellia (Boswellia serrata)¸ appears to have anti-inflammatory and reduce the histamine response. The Nettle (Urtica dioica) - has a long and established history for treatment for seasonal allergies. Ephedra (Ephedra sinicia)( mahuang) is a Chinese medicine that has been used to treat bronchial and inflammatory disorders in for over 5,000 years.